My boys (and girls) LOVE Super Hero capes. Because I had a hard time finding images that I liked, I made some, and will share them with you. It’s a PDF, and you can choose which pages you want to print. Having the their cape be their initial rather than an off the rack version makes them feel loved and special, and I encourage you to try it! Even if you have NO sewing skills, you would be surprised what even a flour-sack dish towel with the paper pinned on will do for a 3-year-old’s energy level. Good Luck and Have fun! Thank you so much for this! I made 2 capes today & these were perfect! 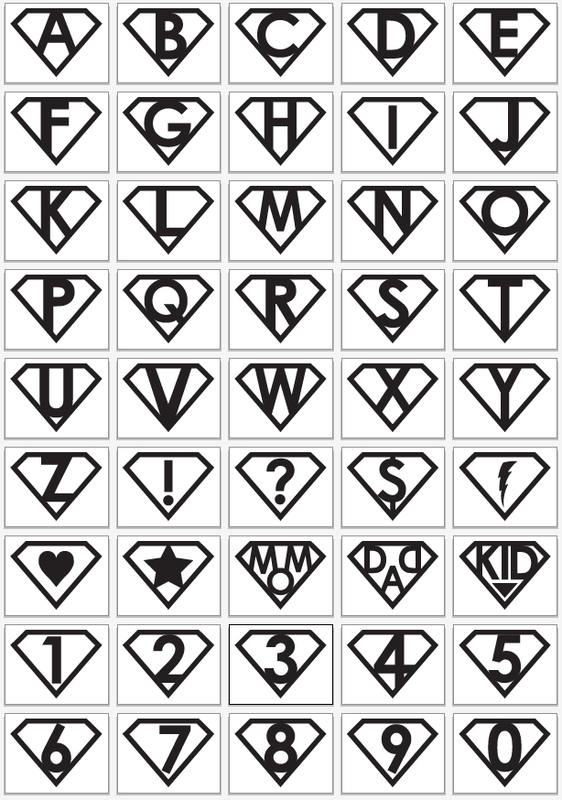 Do you know where I can get the superhero image with a number inside instead of the letters? I have updated them to include the numbers. Thanks for the suggestion! Thank you so much, that is exactly what I was looking for!! Thanks for sharing these, exactly what I was looking for today. How can i get individual letters/numbers? The pdf is made up of multiple pages, each with their own symbol, 1 per page. Thank you so much for sharing! Is it possible to change the color after downloading? Thank you so much, you just saved me hours of photoshop editing!! This is so well done and perfect for all the capes I need to make for our superhero party! Thank you so much for sharing your talent and time. This year’s summer reading is SUPERHEROES: READING IS OUR SUPER POWER! These will come in handy for so many things! These are GREAT!! Also a not so tech savvy teacher…is there a way to make each letter larger? I’d like to use them for my word wall bulletin board. They are infinitely scalable vector PDF’s. Any copy shop should be able to print them at whatever size you would like. Is there anyway I can get these in red? or change to red myself? How do I get the p colored? So wonderful to find, Thanks for posting, mothers on shoe string budgets everywhere are thankful! I have been looking for something like this for months! I would love to have to have the mom in red with yellow background. Anyway to get something like that? THIS IS FABULOUS!! We are using a super hero theme for 5th grade Committee for next year and this is a FABULOUS start to it!! I was just telling my husband today that I couldn’t wait to make a super hero cape for our grandson who just turned two and Ta Da! here is your ingenious website! Thank you for sharing! Thank you so much for sharing this and for free! I’m working on my daughter’s superhero princess party and this is exactly what I’m looking for to make a banner. Do you have a blank one that I can add my own text to? We are using for our classroom and want to do the math operations and basic punctiation marks. I sent them to you Julie Stephenson. Thank you so much! They look great in my classroom! Thank you very much for the very useful logos. Could you please tell me if we can colour them ourselves. I only have an Adobe reader. Adobe Reader does not have the capabilities to do that. Is there a way to use this as an iron-on? These are wonderful, thanks for sharing. I want to print them on iron-on paper, but can’t seem to invert the image. Any tips? Thanks! Hello, I am looking for these in just the white outline so I can change the color of the inside. Can you email them to me by chance? Thanks! Is there anyway I can save these as a jpeg file? I would love to cut them out with my Silhouette so I can have different colors! The graphic can be saved as an image if you right click and do save image as… or you can take a screenshot. Thanks for this Idea. 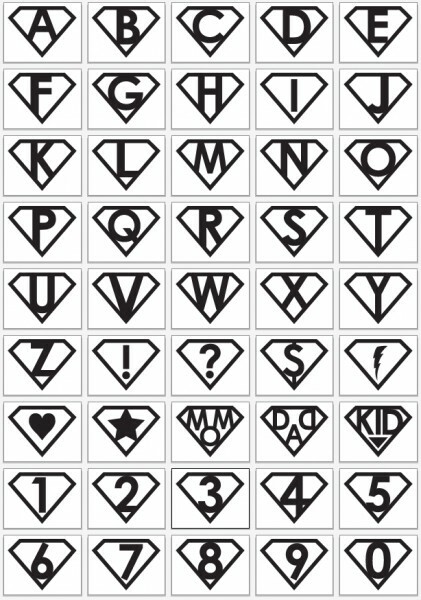 I make this for my nephew a copy mark of a Superman with his first letter to make it his super name so that he can imagine for his self that he is a super hero like super man. I am horrible with technology! I want to use these as a bulletin board and can’t figure out how to print, enlarge or color. I would love these in red. I teach PE so I have K, 1, 2, 3, 4, 5, and 6 grades. I would love one of each of these and is there anyway you could do a PE? I recommend choosing the white ones, then you can color them as you see fit. The link is in the body of this post. Unfortunately, I don’t have the time to make custom designs right now. this is a big help in our hero theme for kids with cancer! thanks so much! Hi these emblems are just what I was looking for …. thanks a lot…. is there anyway you can add a different fonts alphabets? Not really, no. You could import them into Illustrator or something, but at that point, it is just easier to start from scratch.